The RenWeb Home app is available for download in the App Store. RenWeb Home provides parents and students "always-logged-in" instant access to ParentsWeb and FACTS. 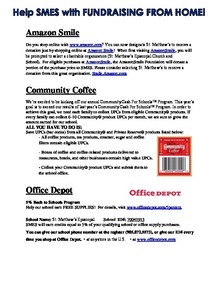 You can help our school earn money just by turning in labels from products you buy. Download "FUNDRAISING FROM HOME 2016-2017.pdf"
Each year, St. Matthew’s most immediate need is the Annual Fund, which directly provides resources that are fundamental to the School’s continued success. Capital gifts helped the School to dynamically rebuild our campus following the November 2010 fire that destroyed the lower school building. The gifts of alumni, parents, grandparents, and friends sustain the spirit of St. Matthew’s and help us to continue to nurture minds, hearts, and souls in a Christian environment. Unrestricted gifts to the Annual Fund support faculty salaries, financial aid, library acquisitions and extra-curricula activities. From academics to athletics to the arts, the Annual Fund provides the resources vital to the School’s success. The Annual Fund is a yearly fundraising initiative that provides vital support to St. Matthew’s current operating budget. One of the most valuable gifts to St. Matthew’s is an Annual Giving gift that helps pay for current obligations surrounding faculty salaries, library materials, scholarships, classroom equipment, special academic programs, athletic programs and student activities. Tuition alone covers roughly 72% of the cost of educating each student. The gap between tuition and the actual expense is around $1,200 per student. St. Matthew’s is an independent, non-profit organization and it receives no outside funding from government or parish sources. While the School is associated with the Church, the two are separate financial entities and funds are not co-mingled. This means that 28% of the school budget must be made up each year through fundraising activities such as the Annual Fund and other fundraising efforts. The School relies on the generosity of its alumni, parents, grandparents and friends to ensure that its students receive the academic excellence they deserve. The tuition at SMES is priced below the actual cost of educating each child so that as many children as possible can experience this unique educational environment. If tuition were raised to the actual cost of educating each student, it would place too large a burden on many parents, and would make it impossible for many qualified students to experience a St. Matthew’s education. Additionally, gifts to the Annual Fund are tax deductible! St. Matthew’s encourages each family to participate in the Annual Fund each year. Want to know what's happening? How you can get involved? How you can help? Parents participate in the community life at St. Matthew’s Episcopal School at every level, from classroom volunteering to social activities to the fundraising events so critical to the maintenance and extension of our academic programs. St. Matthew’s Episcopal School expects parents to become involved, to learn more about their own children and fellow students, to observe their activities firsthand, and to experience the fellowship of other parents in pursuit of our common goal: the best possible education for our children. The Parent Association promotes a positive image of St. Matthew's Episcopal School, in school community and the community at large, by hosting class and parent meetings as necessary, and by promoting parental involvement and participation in school events. Meetings are held a minimum of four times a year between August and May. Special meetings may be called.